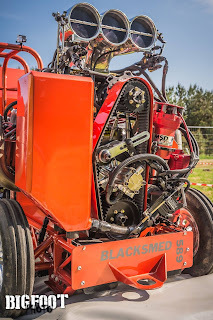 From Vierpolders in the Netherlands, the European Maid Pulling Team have built a completely new Case IH Component Super Stock Tractor for their 35th anniversary during the last Winter. 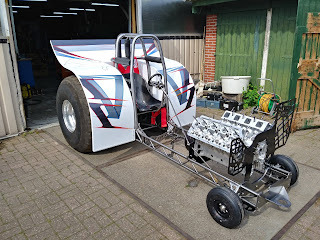 After over 10 years with the old Component Super Stock, the Dutch Team around Bram and his son Joey de Pijper have decided to sell the old IH 3688 to someone else in Europe. 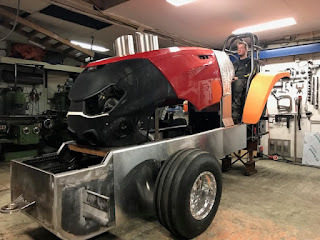 The new Tractor received a completely new homemade chrome-moly tube frame with a newly built homemade rollcage, a new self built sheet metal rearend, a homemade hitch and a homemade hydraulic power steering. 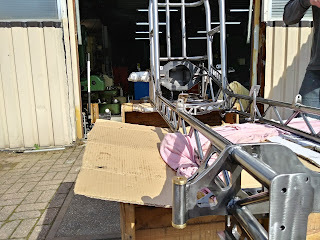 The new chrome-moly chassis is much lighter and has more strength compared to the old European Maid steel wedge frame. Besides during all the maintenance it’s way more easier because they can actually see everything what they are doing through the frame, and they can put their hands or tools between the frame. 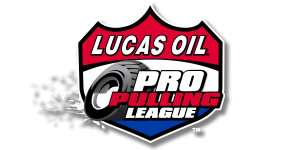 The new Rollcage was built regarding the regulations of the ETPC (European Tractor Pulling Committee). 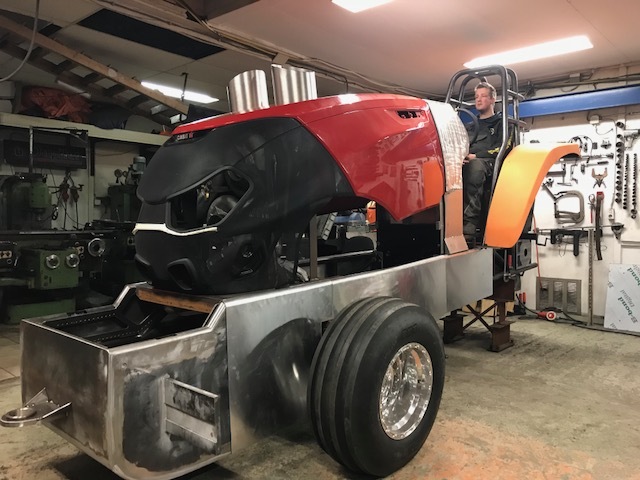 For the new Component Super Stock they have chosen a new Case IH Optum 300 CVX hood, because this was the newest model from Case IH and they think it has a nice and aggressive look. The Optum hood has a lot of details in it, so it also was a challenge to bring this back in the entire Tractor. 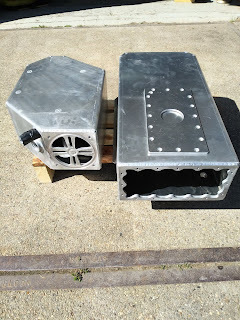 The sheet metal work for the side shields of the hood were done by Jaap Strujk from Dirksland, in the Netherlands. 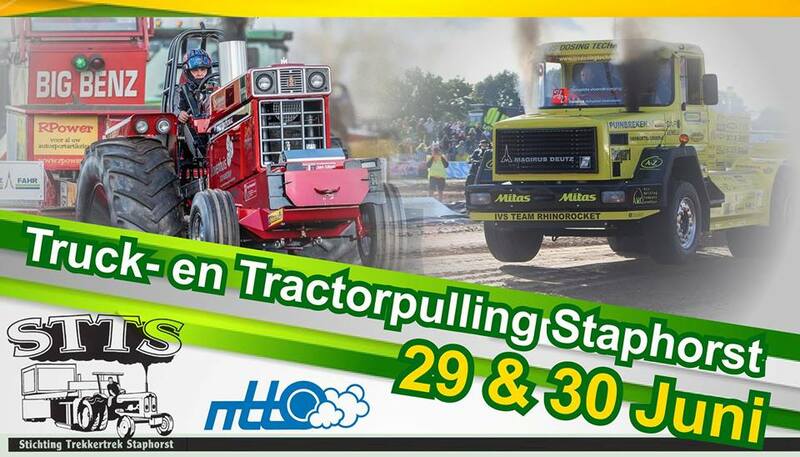 It's currently the first Super Stock Tractor with an Optum hood in Europe. 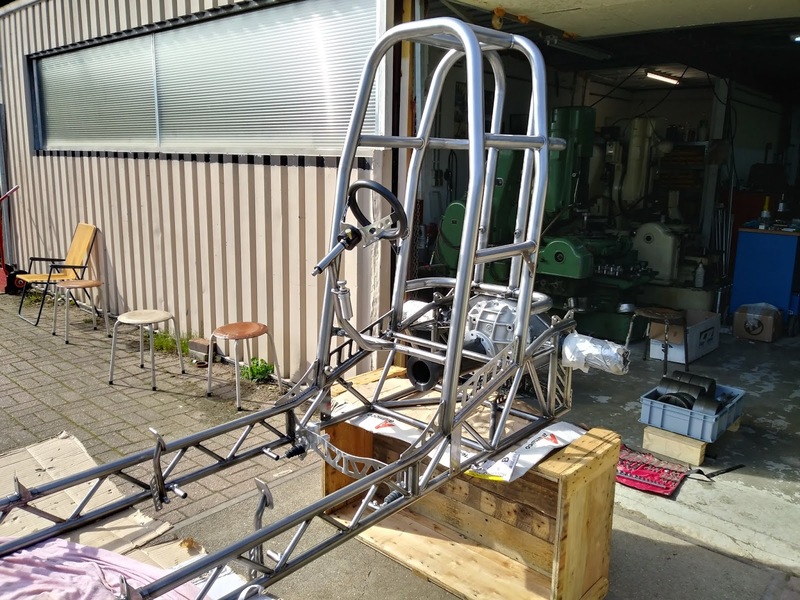 The rear carbon fiber fenders were purchased by Rob van der Waal in Hoeven, the Netherlands. The fenders come from the 2017 Euro Cup & European Super Stock Champion Tractor called ,,Maximum Risk´´. 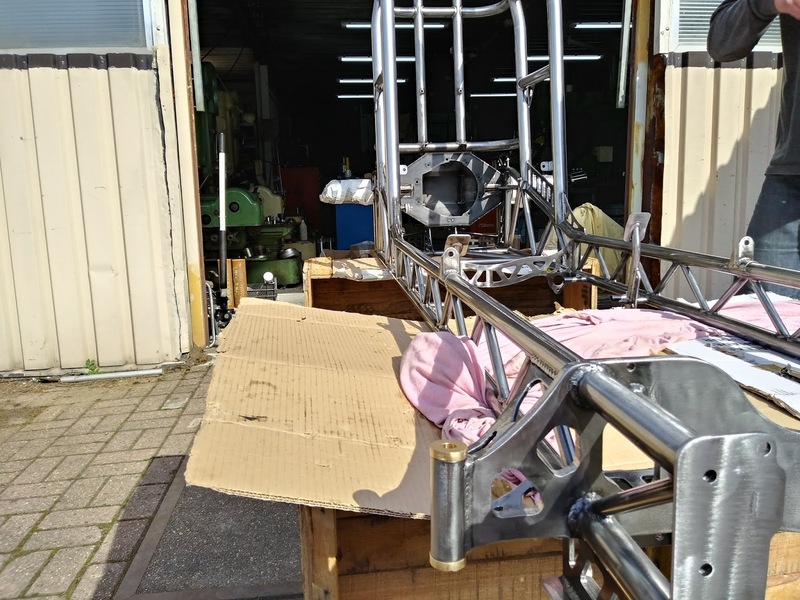 The rest of the sheet metal work on the new chassis were made by the European Maid Team in their own workshop in Vierpolders. 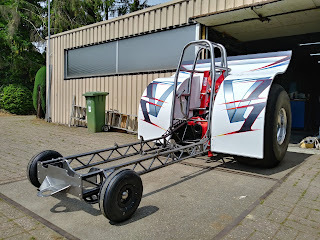 The newly built rearend has a Van der Waal Pulling Parts billet aluminium center section, a Van der Waal Pulling Parts billet aluminium diff with a Rockwell SQHD ring and pinion gear, special made floating axles by van der Waal Pulling Parts and Franklin aluminium planetaries carrier housing with Franklin planetaries. The Tractor also got a new SCS reverser, a Van der Waal Pulling Parts driveline and a 5 disc Van der Waal Pulling Parts centrifugal clutch with a Browell aluminium bell housing. For a good traction, the new ride received a set of polished Midwest aluminium rims with cut Firestone Puller 2000 HP tires. Those wheels were took over of the old IH 3688 Component Super Stock. The new European Maid is powered by a turbocharged 6 cylinder IH DT 466 engine with 10.5l capacity on alcohol fuel. The engine was completely new rebuilt and has a completely new turbocharger setup.The power plant received a IH DT 466 cast iron stock engine block with van der Waal Pulling Parts sleeves, a billet crankshaft with billet aluminium rods and pistons, a billet aluminium cylinder head with a billet steel camshaft, a Van der Waal Pulling Parts fuel system with a Waterman fuel pump, a homemade stainless steel fuel tank, a Aviaid 3 Stage oil pump, a self built steel intake and exhaust manifold, 4 Holset HX 82 turbochargers in 2 steps by BFS airflow-research from Dronten, a MSD 8 ignition and a Racepak data logger. All the billet parts in the IH engine, like the crank, rods, pistons, cylinder head and the camshaft also were manufactured by Rob van der Waal of Van der Waal Pulling Parts from Hoeven, in the Netherlands. 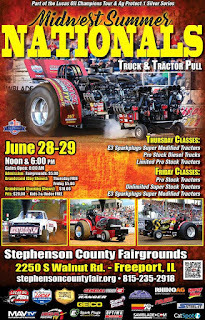 The European Maid Pulling Team compete with their new Case IH Optum 300+ Component Super Stock Tractor in the NTTO Grand National Championship this year. 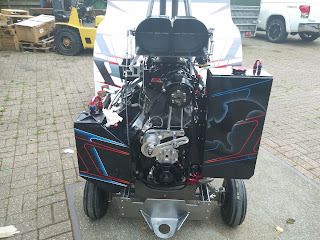 The first passes of the new Super Stock were pretty good, specially the both passes at the Euro Cup round in Made, the Netherlands were impressive. Driver Joey de Pijper made two very nice runs and finished in 7th place in a 19 competitors strong field from all over Europe. The Team is very satisfied with the performence of the Tractor so far and looking now forward to the rest of the season. 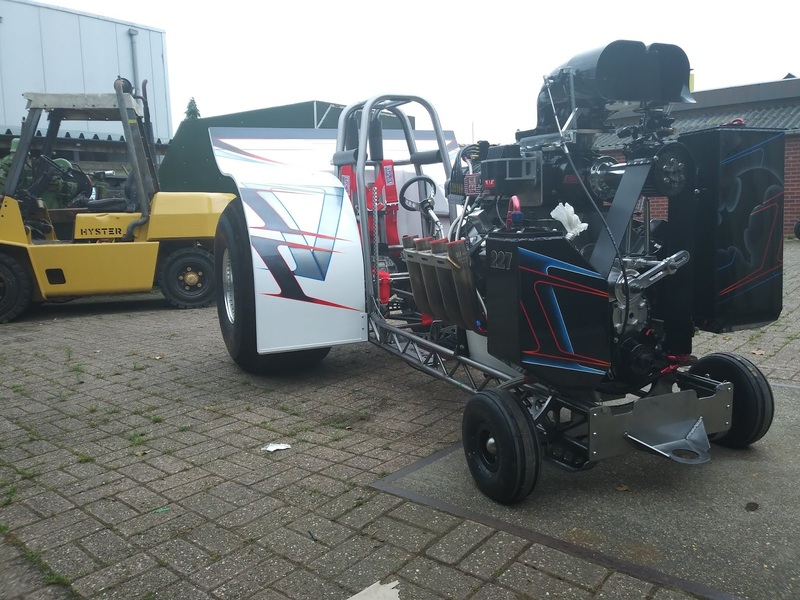 The Vampire Pulling Team around Remi, Mark, Kees and Bennie Vreeman from Neede, in the Netherlands have built a completely new 950kg / 2095lbs. Mini Modified Tractor during the last Winter. After 3 full seasons (2014 – 2017) with the previous Tractor it felt like the right time to build a new Tractor. They booked some good successes with the old Vampire, 2016 Dutch Champion and 2017 3rd in the Dutch Championship. 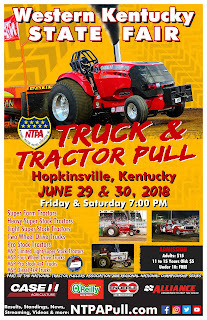 At this point, the old Tractor was still very competitive but sometimes they want something new / different and building is also part of the hobby. The old Vampire was sold to Germany and will compete there in the 2019 season. But what's different on the new one to the old Vampire Mini? Pretty much everything is new, from engine to chassis. The basics are quite similar with some small improvements. 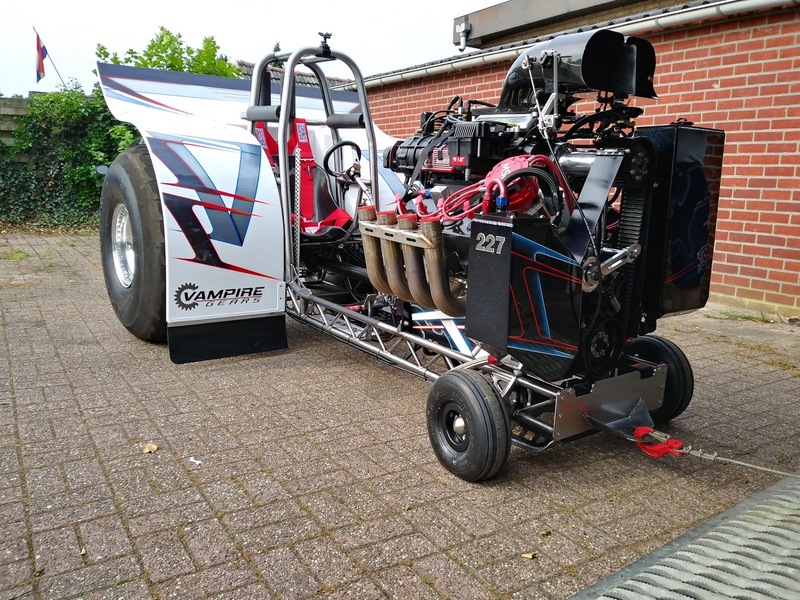 Engine wise, the Dutch Team took it to the next level with a completely new experimental setup. 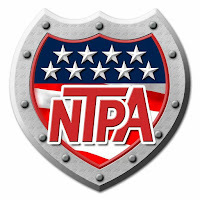 They took the time to make it something really nice this time with a lot of attention to all the small details. The new Vampire got a completely new chrome-moly tube frame with a chrome-moly rollcage, a homemade sheet metal rear axle housing, a manual steering with a rack and pinion steering box and new light weight carbon fiber fenders by Gertie Leusink (Simply Irresistible Pulling Team) from Dronten, in the Netherlands. The most of the parts in the chassis were made off 25CrMo4. 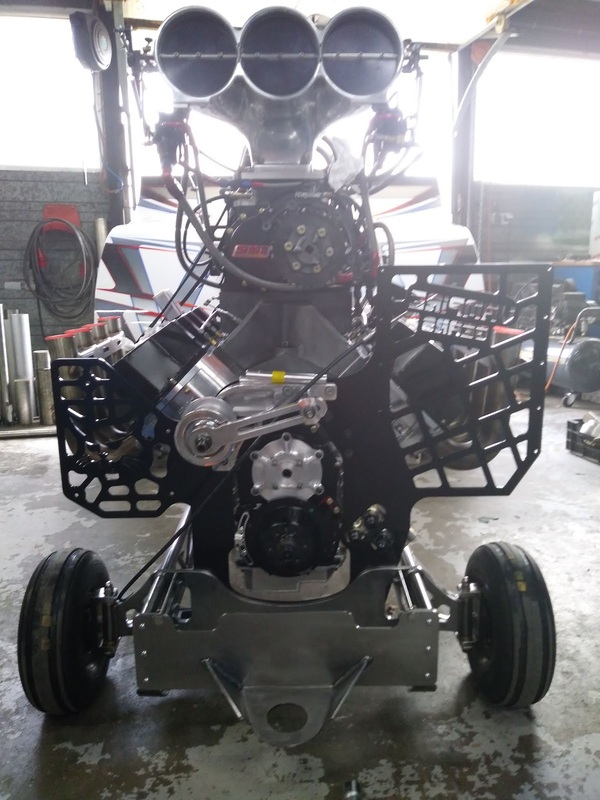 The new chrome-moly Chassis was built by the Screamin' Bobcat Pulling Team from Ijsselmuiden, in the Netherlands and is the latest 2018 version from the Boer Family. 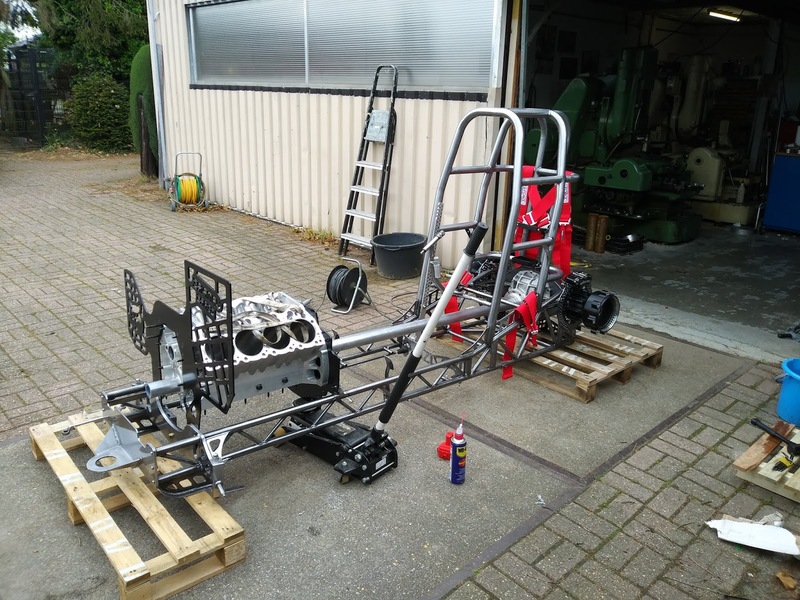 A lot's of small changes were made on the Chassis to make it stronger, more maintenance friendly and lighter. The new rearend has a Ford 9" inch center section with a homemade aluminium diff, a special made Ford 9" inch ring and pinion gear, self built planetaries carrier housing with homemade planetaries and Willwood brake calipers from the USA with homemade brake discs. Also the drivetrain of the Mini was completely new built. The ride received a homemade single speed gearbox in the latest lightweight design, a billet driveline, a 8" inch Molinari centrifugal clutch with 3 discs and a 8" inch Browell aluminium clutch bell housing. The CNC-milled housing for the gearbox was made from aluminium. All the homemade and billet parts for the rearend and the drivetrain were made in the company of Bennie Vreeman called ,,Vampire Gears" in Neede. 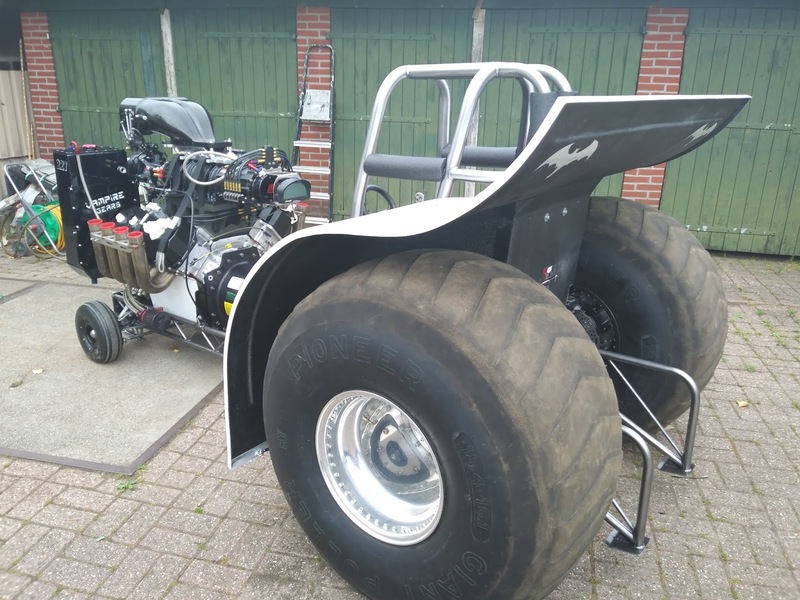 For the maximum traction on the Pulling tracks in the Netherlands, they purchased a set of new Real Wheel aluminium rims with new Pioneer Giant Puller tires from the USA. The new design on the fenders is self made and the new Chassis was clear coated. 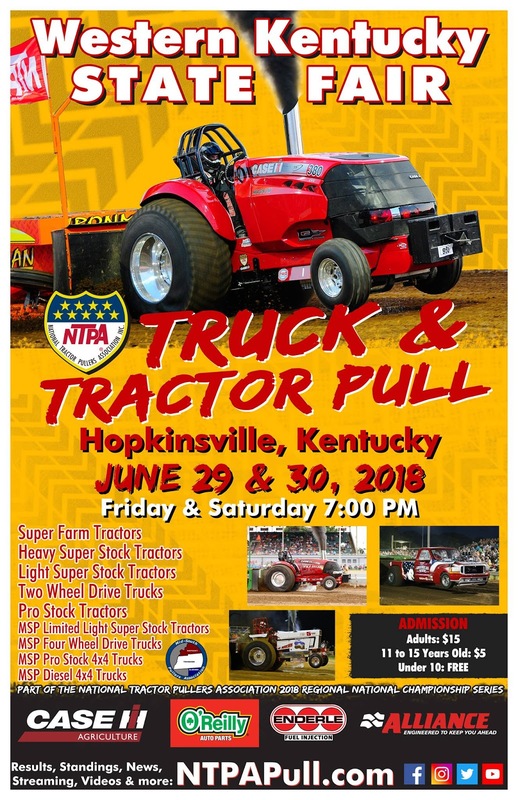 For the graphics they choosen an more aggressive design, but still recognizable in style compared to the previous Tractor. Also the Vampire / Bat has a more prominent place now and really stands out on the fuel tank and also as contour on the fenders. 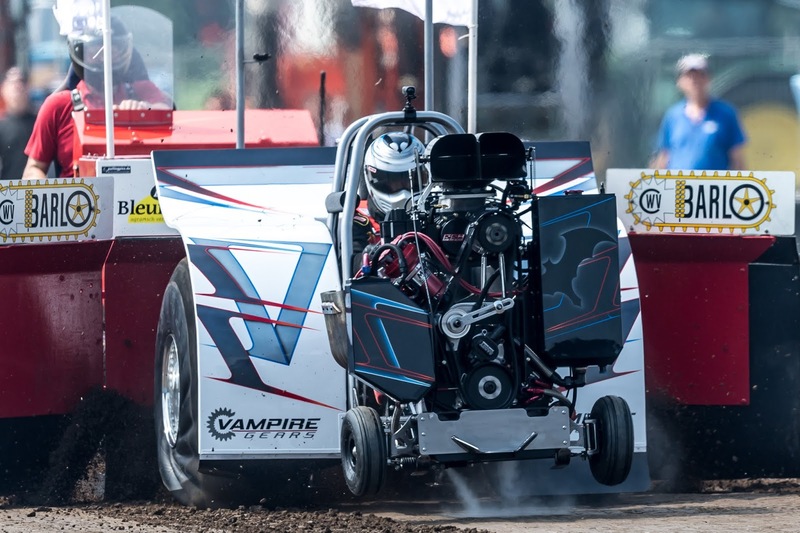 The new Vampire Mini Mod is powered by a blown BAE V8 Hemi engine on methanol fuel. The power plant has a BAE billet aluminium block with Veney ,,Bath Tub" heads, Moroso valve covers, a billet crankshaft by Valesco, JE billet pistons and billet MGP rods, a billet SSI 18-71 blower, a John Force carbon fiber injector with fuel spraybar for intake air cooling (1 of 3 ever made), a Sassy Racing fuel system with a Sassy Racing single fuel pump, a homemade aluminium sheet metal fuel and oil tank, a dry sump lubrication with a extra oil filter, a upgraded MSD 44 + Pro Mag ignition and a Racepak data logger. What are the hopes with the new Tractor? The Vampire Team expect this to be a learning year with the new Tractor and engine setup. Also the new Sledge in the Netherlands will ask for a different approach. But of course they will play hard this year and try to take the victory ! The competition is really strong, so it will be an interesting season for sure. 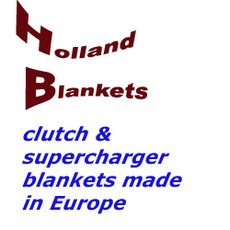 In the past they booked many successes in the USA with their drivelines and Boer chassis combination and really put Europe on the map together. 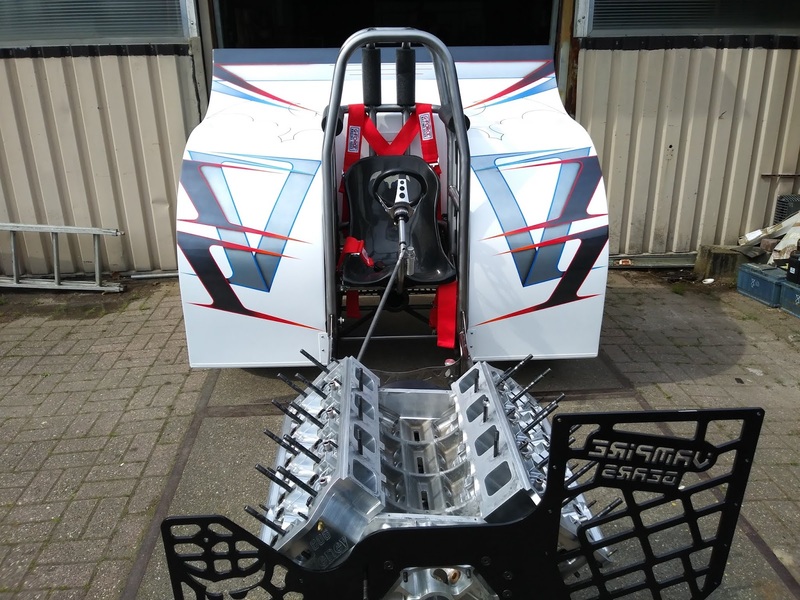 Mark, Kees, Remi and Bennie looking forward to this season and expect a lot from the new Sledge in Holland which will bring distances closer together for an even better competition and show ! And how was the maiden run of the new Vampire? Mark made 2 great passes in front of the old No Mercy Sledge and finished on a nice 2nd place behind Hella Lambada 9 of the Dingerink Family. Simply a great start into the season with the new Mini Mod ! ,,Black Smed´´ that´s the name of a new 950kg / 2095lbs. Mini Modified Tractor in Denmark. 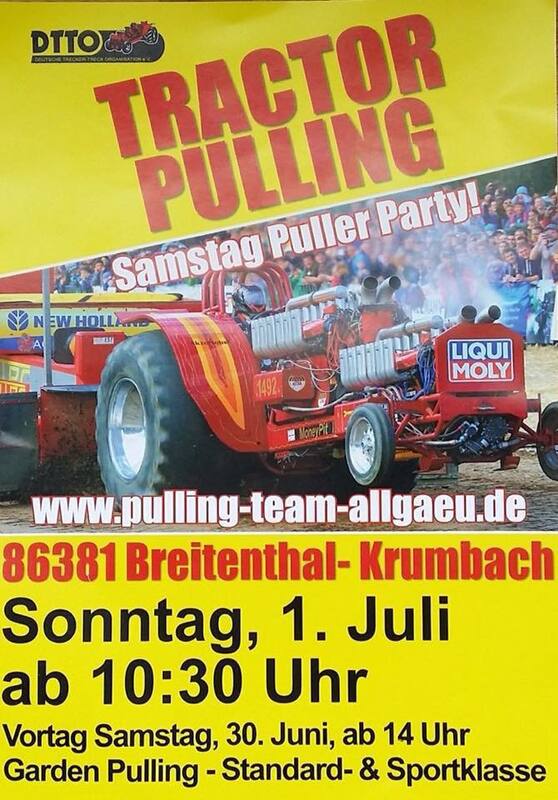 It´s also a return of a not unknown person into the pulling sport, who was successful as Modified driver for a Danish Pulling Team in the late 90s. The person is Flemming Smed, 44 years old from Herning in Denmark. 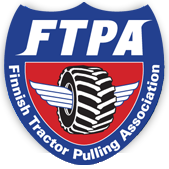 Flemming was a long time Team member of the Fox Pulling Team, who was own by Torben Larsen in that time. He was the engine man behind the Fox Team and also later the driver of the Modified Tractors called ,,Fox´´ and ,,Fox Junior´´ from 1997 - 1999. 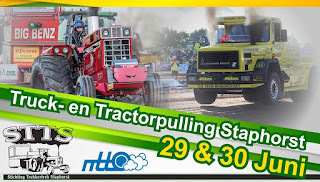 In 1997, Flemming become the new driver of the Fox Tractor, because Torben Larsen´s brother Peter retired from the Pulling Sport in the beginning of 1997. He was pretty successful in that time, won a couple of Euro Cup rounds and national pulls in Europe. 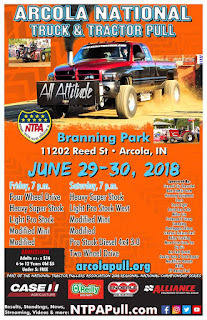 2 times he finished in runner up position of the Euro Cup point standings in the 4.5t Modified class. That was in the year of 1997 and 1999. In the end of 1999, Flemming stopped with Pulling. But he never was completely away from the pulling circus. 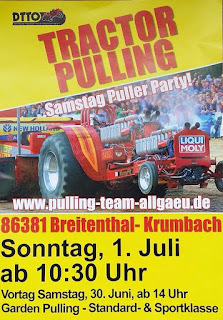 Sometimes he helped out as engine mechanic at the Fox Team or he was at the pulling events as spectator, like at the European Superpull in Rotterdam, the Netherlands or on his Euro Cup home pull in Herning / Brande. Last season there came the possibility to built a Mini Modified Tractor. 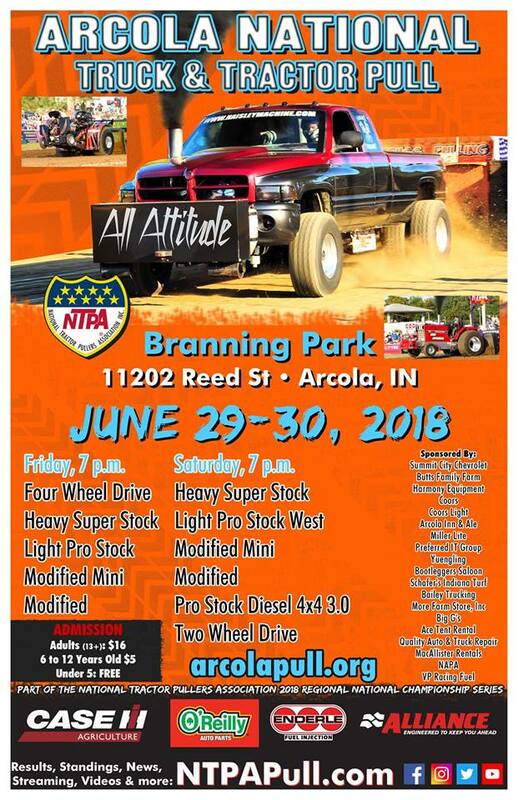 A Mini Mod Chassis of the Lambada Pulling Team was for sale. In September 2017, he purchased the old Hella Lambada 9 Chassis of the Dingerink Family from Zwolle, in the Netherlands. 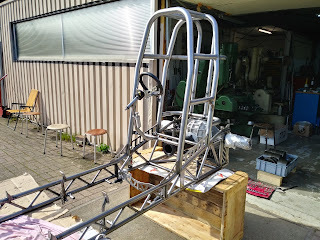 The Chassis has a chrome-moly tube frame with a chrome-moly cage, a custom built steering, a Advanced Chassis sheetmetal rear axle housing from the USA and light weight carbon fiber fenders. The Advanced rearend has a TRB Machine & Tool billet aluminium center section with a billet aluminium diff, a Rockwell F106 ring and pinion gear, Strange brake calipers and brake discs. 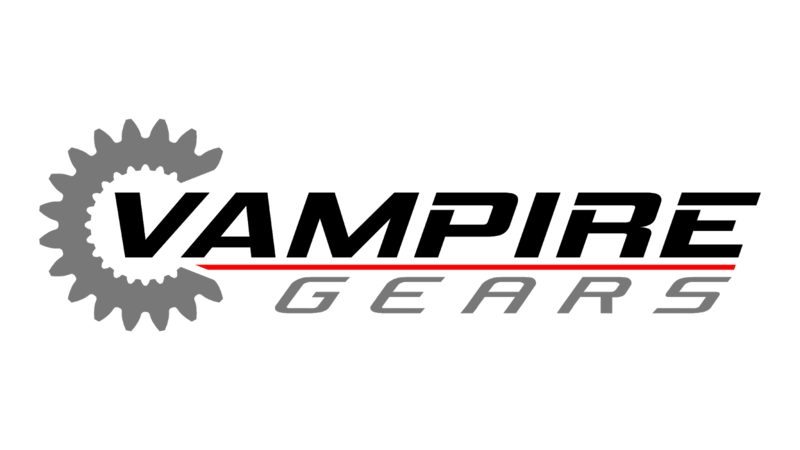 The billet aluminium diff is a Vampire Gears (Bennie Vreeman) / TRB Machine & Tool combination. The Mini also got a Vampire Gears transmission with a custom built driveline, a new Trick Titanium bell housing and a Molinari 10" inch centrifugal clutch with 2 discs. In the package of the Lambada Tractor also were a set of used Real Wheel aluminium rims with Pioneer Giant Puller tires. The new Black Smed is powered by AJPE 5300 V8 Hemi engine on methanol fuel. It's currently one of three Mini Mods (Ghost Buster Pulling Team from Germany also has two Minis with AJPE motors) in Europe who's running with an AJPE power plant. The new engine has AJPE billet aluminium block with new AJPE 5300 cylinder heads, Manley valves and valve springs, homemade stainless steel exhaust headers, a Bryant crankshaft with GRP billet aluminium rods and Wiseco pistons, a DMPE 18-71 blower with a Enderle big & ugly scoop, a RCD oil pump, a homemade fuel tank, a Sassy Racing fuel system with a Sassy Racing fuel pump and a MSD 44 Pro Mag ignition. Last but not least the ride received a completely new paintjob and new vinyl graphics on the fenders. 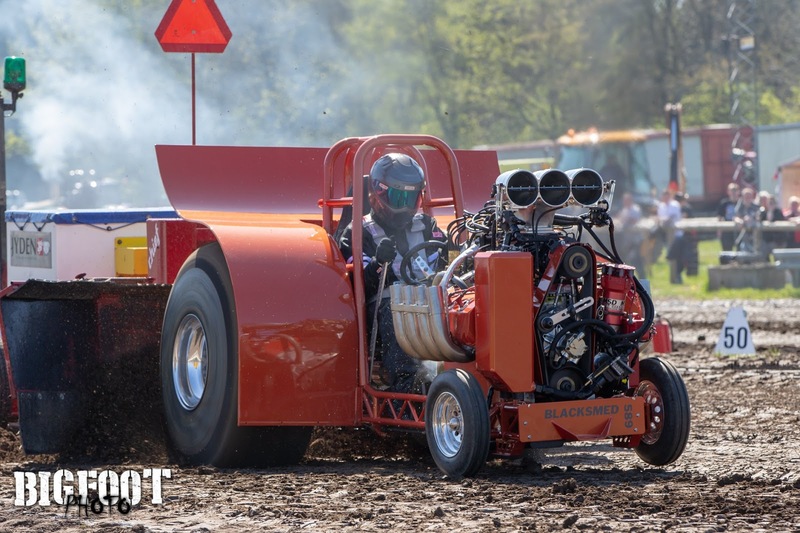 All in all, the new Black Smed is currently the most powerful Mini Mod in Denmark. 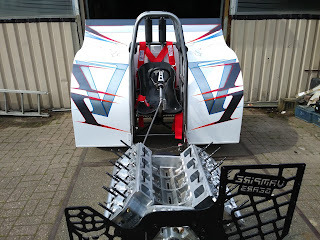 Flemming compete with his new toy in the Danish Championship this season. 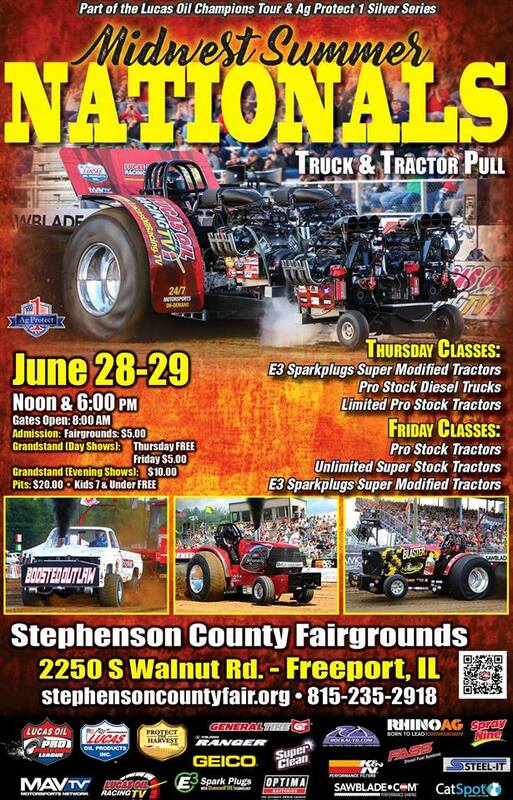 Flemming Smed would also like to give a big thanks to Johannes Hauge for machining all custom parts for the Tractor !